Future of Mariners Mile continues to be a mystery as city leaders and planners still have not established any direction to revitalize the harborside village. City leaders and planners still have not established any direction to revitalize the harborside village. NEWPORT BEACH — City planning in a major metropolitan neighborhood is never an easy task to accomplish. Without fail there are bound to be multiple cooks in the kitchen, each presenting overlapping, competing or disjointed proposals of how they would like to see an area developed or redeveloped. 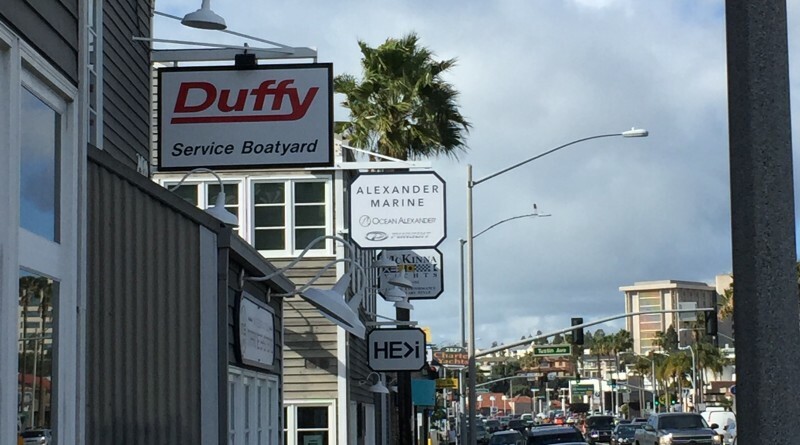 No truer is this mantra than at Mariners Mile, a small harbor-themed village along a 1.3-mile stretch of Coast Highway in Newport Beach once a destination for recreational boaters but now steadily evolving into a commercial destination for diners, boutique store shoppers and luxury car owners. Amidst the village’s evolution has been five years of city planning and envisioning of how a revitalized Mariners Mile would look like – with little to no results. The Mariners Mile Business Association has campaigned to revitalize the 1.3-mile stretch of Coast Highway in an effort to create more opportunities for retail. City staff brought on a consulting group in 2014 to flesh out possible design concepts for a new Mariners Mile. The relationship fizzled almost two years after the first workshops. Late last year Don Haskell, the influential owner of several land parcels at Mariners Mile, passed away. The land holdings, which housed Ardell Yacht and Ship Brokers, Silver Seas Yachts, and Sun Country Marine, were sold on Jan. 5 to developer Manouch Moshayedi. Moshayedi appeared in front of the Newport Beach City Council on May 24 and addressed the dais during a study session on the future of Mariners Mile. Later in the meeting council members awarded a $206,000 contract to develop a revitalization master plan for Mariners Mile. The study session and contract award coincided with recent studies by the Orange County Transit Association (OCTA) and City Hall assessing the capacity needs of Coast Highway through Mariners Mile. Newport Beach now hopes to evaluate the studies to develop a revitalization plan for Mariners Mile, although the city is not expecting any funding support from the state to revitalize the harborside village. But Public Works Director David Webb said OCTA, city tax revenue and various matching funds would be used to help pay for Coast Highway improvements and the Mariners Mile revitalization. “I do think we’re moving to more a multimodal nature,” Webb said, adding the city is encouraging greater bicycle use and the future use of Uber or driverless cars could greatly affect traffic patterns one way or another. City planners would be studying variations of a six-lane highway and parking plans. Council member Keith Curry added the city should coordinate all planning with businesses within Mariners Mile to avoid causing them economic harm. Webb added a revitalized Mariners Mile could feature a five- or six-lane Coast Highway and reconfigured signal lights. Moshayedi, who owns a large chunk of land along Coast Highway on Mariners Mile, said building a superhighway between Dover and Newport would be bad news for retailers. Council member Tony Petros disagreed with Corona Del Mar serving as a model for how to plan for a revitalized Mariners Mile, saying there is a high turnover rate amongst businesses. Petros added Coast Highway would not be a freeway or superhighway. “You’re not getting a freeway, you’re not getting a superhighway, you’re getting a very slow moving, chugging facility that has six lanes of capacity,” Petros said in response to Moushayadi’s comments. The bigger issue, according to Petros, is the lack of vision and decision-making about how Mariners Mile would look once revitalized – if at all. “What business really appreciates is some level of certainty in their decision-making. If they know what’s in front of them they could make good decisions and move on,” Petros said. “The problem with Mariners Mile right now is that there is a complete lack of certainty in what is going on there. Is it going to be five lanes? Is it going to be six? What happens under the different configurations of that six-lane highway? The council member believes Newport Beach has much leeway in shrinking the size of Coast Highway through Mariners Mile. “I don’t believe we have much discretion to suggest anything but the six-lane facility, given the fact that it is indicated on those master plans as a six-lane road and it is CalTrans road to administer,” Petros told his colleagues, adding the only question up for debate is what right of way would the city develop to restrict or manage the six-lane highway. Newport Beach city staff will continue to study variations of how to redevelop Coast Highway, but for now the future of Mariners Mile continues to be out of focus.